SFMOMA Artists Gallery: John Yoyogi Fortes, Jessalyn Haggenjos and Mike Narciso (in the main gallery); Tip of the Blade – Pamela Belknap, Jason Winshell, George Pfau (in the loft space). Review and images by Kathryn Arnold: On exhibit in the main gallery are John Yoyogi Fortes paintings/collages, Jessalyn Haggenjos enamel based paintings, and Mike Narciso, photography. In the upstairs gallery is a separately curated exhibition (focusing on civil rights in celebration of Martin Luther King Jr.) titled ‘Tip of the Blade’ with artists Pamela Belknap photography, George Pfau mixed media painting/drawing and Jason Winshell photography. Before beginning the coverage of the artwork, I wish to mention the amazing work that Maria Medua (director of the Artists Gallery) and her crew perform each and every month. In particular, opening of six artists’ works all at one time, as they have done this month, is truly an amazing feat and is deserving of recognition. The Artists Gallery is a non-profit space affiliated with SFMOMA. It leases out artwork along with selling it outright, and is well worth a visit just to peruse all of the art they have available. Upon arriving, I head up the stairs and begin viewing George Pfau’s range of works. They are meticulously crafted, form-matching-content types of works as visually understood with the boundary creations of contour line and transparent effects in see-through surfaces enhancing skeletal structures. Also incorporated are overlapping of translucent and transparent images defined by edges. Pfau has an excellent artist’s statement in which he mentions his interest in Martin Luther King Jr.’s near death experience in Harlem. The artist ties this to a state of becoming. 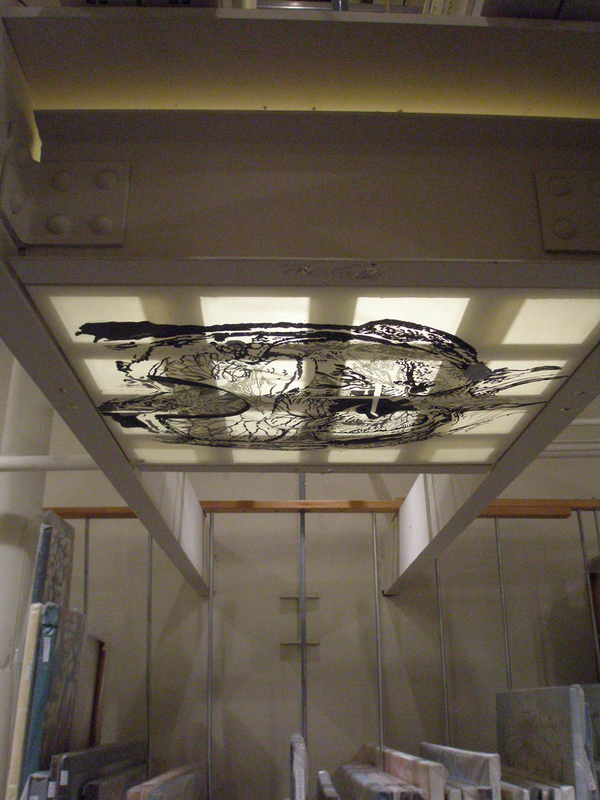 One work is installed on the ceiling with backlight and another is structured like a shrine. Formal concerns together with conceptual, the installation reads well. Jason Winshell’s photographs depict a variety of scenes from day to day life and experience; I need a return trip to view them more in detail. When you visit, you will see that there are many of these small photographs to select from. Next, as part of the main gallery exhibition but on the second floor, are Mike Narciso’s photographs from his Tarp series. They are dark and mysterious and one begins to realize they are all tarps after viewing them a short while. They are almost painterly in the manner with which they draw you in with all of the variations in subtleties. 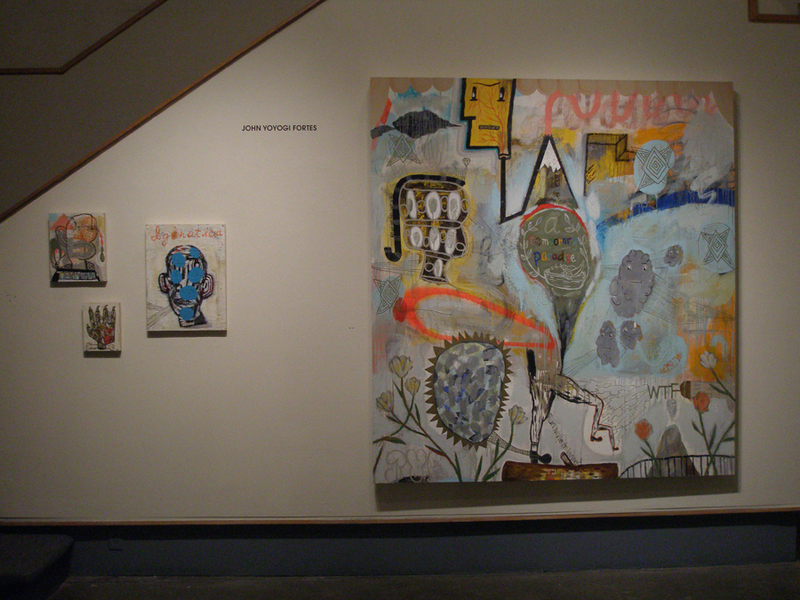 Downstairs I experience the paintings of John Yoyogi Fortes, many incorporating collaged elements. Feeling neo-expressionist in nature, I am reminded of the works of Jean-Michel Basquait (NYC painter) yet there are differences. Fortes’s works seem to have a script or a narrative that ties the images together. The collaged elements make reference to our visual culture and create serious themes. The largely gestural paint qualities are exhilerating while pointing to some of the grit and grime that surround us. Beauty and pain. Jessalyn Haggenjos’ enamel based paintings are my last stop through this large and elaborate exhibition. She allows the natural process of pouring enamels to form her imagery, referencing topographical formations. These works engage a form of automatism to signify nature at work. The colors however are not necessarily ‘landscapey’ but more like Miro or Matta (in the earthy-toned pieces).